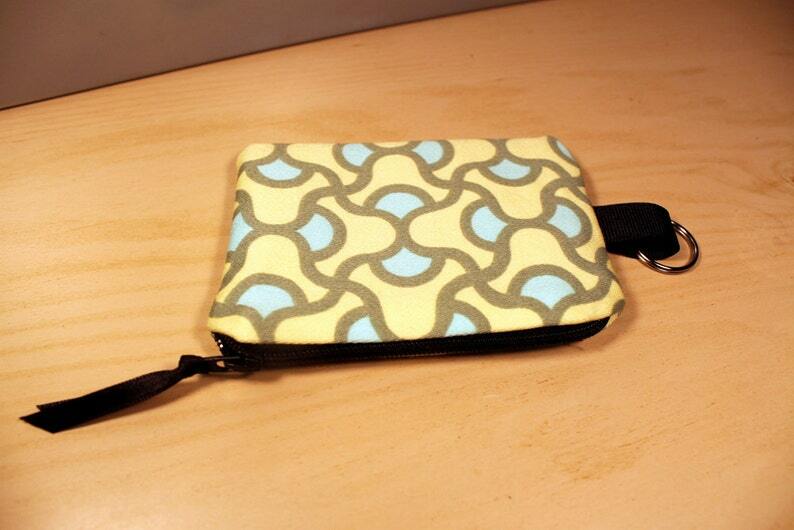 This little coin pouch is big enough to fit credit cards, cash, and keys - yet small enough to also fit in your pocket! Outer material is a sturdy upholstery/home dec fabric by Amy Butler and lined with a grey interfaced cotton. Black zipper has a ribbon pull for easy opening and closing. There is also a handy key ring attached to one side so that you can attach keys and/or attach it to another item. Measures approximately 4.75" wide x 3.5" tall x .5" deep. Pattern placement may vary slightly from item in pictures. Super cute fabric and fast delivery! Love this! Quick delivery and well made / charming little bag. thank you! Great bag! Nice and lightweight - good size. Shipping was in good time. Thanks Andrea! Beautiful colors! Love the owl! Thank you! If your item arrives damaged or if you are not satisfied with your purchase, please convo me and we can work out an exchange. I will mail out your purchase within 2 business days of your order/payment through USPS. Your order should arrive within 3-5 business days, if you need speedy delivery just let me know. Shipping fee includes postage & packaging. I have one dog and one cat. I work in a totally non-smoking environment.